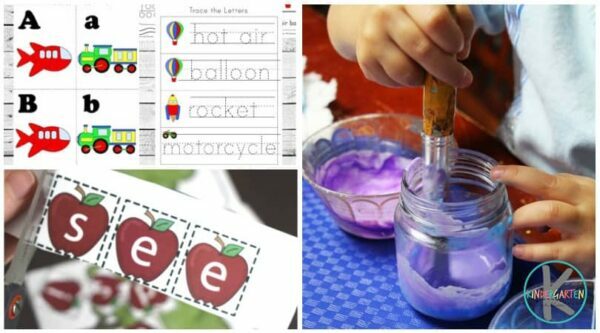 Keeping your kindergartner engaged and learning is easy when you use fun free kindergarten themes in your curriculum. From popcorn to outer space, you’ll find a ton of themes that your children will absolutely love. If you’re looking for free kindergarten themes to help teach your children, this is the place to start. You’ll find 12 of the most popular different themes and 5 learning activities for each theme, giving you plenty of options for teaching your child. If you’re looking for the perfect back-to-school theme for your kindergartener, then you need to use an apple theme. There are so many crafts, activities and worksheets for both reading and math, all of which are apple themed! Apple Tree Counting Puzzle – Practice counting with this apple themed activity. Apple Threading Number Order Activity – Here’s an apple activity that helps your child practice math. Apple Patterns Do-A-Dot Activity – Patterns are fun to practice with this activity. Apple Tree Sight Words Printable – Don’t forget sight word practice with this apple printable. Paper Plate & Coffee Filter Apple Craft – This apple craft is super fun to make! When you think of the circus, you probably think of fun! That’s why these circus-themed activities are great for your kids. They’ll have fun learning reading, math and more. Circus Clown Coloring Sheet – This coloring sheet is perfect for your circus-themed day. Circus Do-A-Dot Printables – Here are some hands-on circus printables. Free Circus Worksheets – Take a look at these circus-themed worksheets for reading and math! Circus Alphabet Puzzles – Learning the alphabet is fun with this circus puzzle. Circus Kindergarten Math Worksheets – Here’s a great way for your kindergartener to practice math. A dinosaur theme is a fun way to teach your kids reading, math and more! These dino worksheets and printables will help your kindergartener learn what they need to know, from addition and subtraction to reading independently. Dinosaur Emergent Reader – This dinosaur-themed book will get your kindergartener excited about reading. Free Dinosaur Printable Pack – This printable pack has it all, from dinosaur patterns to matching games. Dinosaur Addition Cards – These addition cards will help your kindergartener with important math skills. Dinosaur Kindergarten Math Worksheets – Practice math with these “dino-rific” worksheets. Free Dinosaur Math Worksheets – Use these worksheets to practice addition, subtraction, and even graphing! If you have a child who loves all things farm, then this is the kindergarten theme for you! These farm-themed worksheets and games will help teach your child to read, skip count, and more. Free Roll a Farm Number Sense – Here’s an interactive math game that’s farm themed! Farm Animal ABC Search – Your kindergartener will love coloring in this farm worksheet using the ABC color key. Graphing Farm Animals – Introduce your kindergartener to graphing with this farm game. Farm Skip Counting Math Worksheets – Skip counting is fun when you use these farm worksheets. Free Counting Farm Animals Emergent Reader – This beginner book is all about farm animals! Who doesn’t love ice cream?! Use these ice cream worksheets, games and cards to practice counting, the alphabet and patterns. After, make sure you have a tasty ice cream treat. Free Ice Cream Alphabet Puzzles – Your child will enjoy putting together these alphabet puzzles! Ice Cream Counting Mats – These counting mats will help your child practice their counting skills. CVC Words Ice Cream Sundae – Your child will love using these ice cream sundae pieces to make CVC words. Build an Ice Cream Activity – This activity helps with many math skills, including making patterns and counting. Ice Cream Counting Cards – Use these ice cream cards and pom-poms to practice counting! Monsters are fun, not scary, with these activities and games. From memory games to flip cards, you’ll find activities that are perfect for some monster math. Free Monster Counting and Addition Math Activity – Your child will have some monster fun with this counting and addition activity. Monster Counting Activity – Your kindergartener will beg to play this counting game over and over again! Paper Monster Craft for Kids – Break out your crafting supplies and have fun with this monster craft. Free Monster Memory Game – Practice counting while having fun with this monster memory game. Monster Chore Charts – Will your child be able to meet his goals for the week using this cute printable? Explore the ocean and the creatures that live in it with these kindergarten themed activities. You’ll find count and clip cards, slime recipes, mazes and more. Watercolor and Crayon Ocean Craft – Start your ocean theme with a fun craft your kids will love. Ocean Animal Count and Clip – Take a look at these count and clip cards. They’re ocean themed! Free Pearl Count to 20 Activity – Count these “pearls” with this ocean-themed activity. 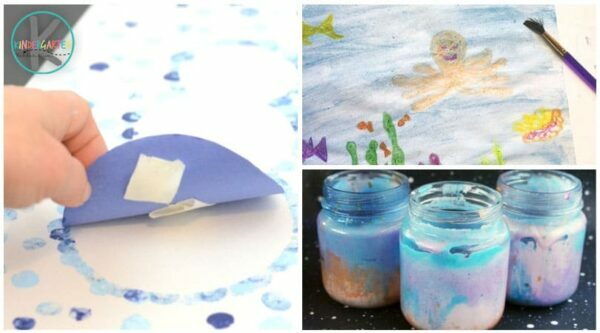 Ocean Slime Recipe – Here’s a fun ocean activity that your kids are sure to love. Ocean Animal Mazes – Will your kindergartener be able to figure out these ocean mazes? Penguin themed worksheets will get your kindergartener excited about learning. With such a cute and fun theme, your child won’t even know they’re learning counting, number words, graphing and sorting. Penguin Tracing Number Words – Use these penguin tracing cards to teach your child to write number words. Cotton Balls Penguin Craft – Here’s a craft your kindergartener will have fun making. Free Penguin Shape Sorting Activity – Practice identifying shapes, such as ovals, triangles and octagons, with this penguin activity. Penguin Shapes Roll and Graph – Keep on practicing those shapes with a roll and graph game. Free Counting Penguin Clip Cards – These clip cards are a hands-on way to practice counting. Not only is popcorn a delicious treat, it’s also a great theme to teach your kindergartener. From poppin sight words to popcorn alphabetical order, all of these popcorn-themed activities will help your child learn in a fun way. Free Popcorn Alphabetical Order Activity – This popcorn activity teaches your child to put words in alphabetical order. Syllables Popcorn Sorting Activity – Here’s a great popcorn activity that will help your child learn about syllables. Free Popcorn B and D Reversal Activities – Does your child reverse Bs and Ds? This popcorn activity can help. Popcorn Word Families – Practice word families with this popcorn-themed activity. Free Poppin Sight Word Worksheets – Get poppin on sight words using this popcorn themed worksheet. Snowman activities and worksheets are perfect for winter. When there’s snow on the ground, you can have fun inside learning how to tell time or subtract numbers. Afterwards, go outside and have fun building a snowman in your yard! Free Build a Snowman Sequencing Worksheets – You’ll stay warm and cozy inside with this snowman building activity. Snowman Thumbprint Art – Here’s a snowman-themed art project that your child will be proud of! Free Snowman Telling Time Activity – This is a great way for your child to learn how to tell time! Snowman Subtraction Mats – Use these snowman mats to practice subtraction. It’ll be fun! Melting Snowman Slime – Not only is snowman slime fun to make, but playing with it will also help develop your child’s motor skills. Space is an out-of-this-world theme that your kids will love. These space-themed worksheets and activities help your kindergartener practice CVC words, numbers, ABCs and more. Outer Space Math Worksheets Packet – Practice everything math with this space worksheet packet. Astronaut Ten Frame Matching Game – Match astronauts to their space ships with this number matching game. Outer Space ABC Seek and Find and Color by Number Printable – These two outer space activities will quickly become a favorite for your kindergartener. Space CVC Word Building – Practicing CVC words is easy with this space activity. Nebula in a Jar Craft – This nebula in a jar craft will get your kids excited about outer space. If your child loves cars, trucks, or planes, then transportation-themed learning activities will be highly effective. From ABCs to subtracting, your child will practice important learning skills with these transportation worksheets and games. Free Transportation Pom Pom Matching – Practice those fine motor skills with this transportation game. Transportation Bingo – Bingo is such a fun way to practice different learning goals! Free Transportation Worksheets – Here are some great language arts and math worksheets, all of which are transportation-themed. Transportation Subtraction Cards – Subtracting is fun when you use these transportation cards. Free Tractor Alphabet Plowing – Here’s a fun, hands-on way to teach your kindergartener the alphabet. 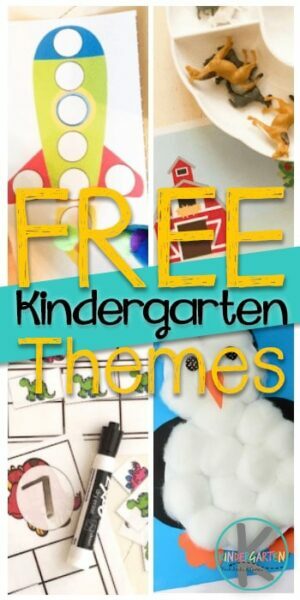 No matter what your child is interested in, these free kindergarten themes are sure to spark some interest. Which of these themes do you think your child will love?